Ocasio-Cortez supports impeaching Trump. Trump may have overlooked the fact that Ocasio-Cortez doesn't like him any more than Crowley does. She said this week that while she thinks the Democrats should run on policy issues, not just opposition to Trump, she supports impeaching the president and believes there's enough evidence to do so, Politico reports. A "perfect storm" in Queens. The New York Times looks at the "perfect storm" of circumstances that led to Crowley, a powerful local Democratic Party boss, being defeated in New York's 14th District by Ocasio-Cortez, an outspoken socialist who would become the youngest woman ever elected to Congress if she wins in November. In a poll conducted three weeks before the election, Crowley was 36 points ahead. Major shake-up for Democrats. With Crowley on his way out, the race for leadership positions in the House caucus is now seen as wide open—and progressive policies are on the way up. "It's a clarion call for bold, progressive leadership and having an agenda of 'Medicare for all,' free public college, [being] against police brutality, having a clear vision and conviction-based politics," California Rep. Ro Khanna tells the Hill. More from Fargo. 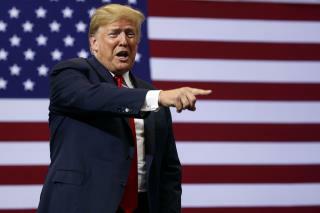 At Wednesday night's rally, Trump also slammed Rep. Maxine Waters, bashed "the elite" as "stone-cold losers," and said the justice who replaces retiring Supreme Court Justice Anthony Kennedy could be on the court for 40 to 45 years, CBS News reports. "I'm very honored that he chose to do it during my term in office because he felt confident in me," Trump said of Kennedy's retirement. Let me let you all in on a dirty little secret. College is free if you're good enough and smart enough. The more "progressive" the Democrats get the more voters will kick them to the curb. Leftward movement of the Democrat party is a predictable reaction to the recent political jolt to the right of the Republican party. Bernie Sanders' campaign was a warning tremor ~ a portent of the earthquake about to come. When the depth and extent of Trump corruption becomes known the shaking will start. By Novermber, the Republican skyscraper will be swaying in fatal fashion.